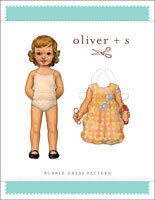 Share your photos on Instagram with the hashtags #playdatedress and #oliverands. Girl's dress. 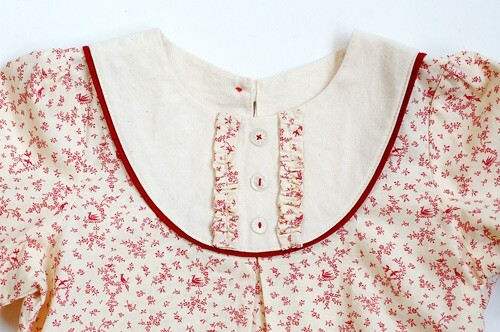 A-line dress has bib-style yoke with flat piping, button details, optional ruffles at front, and button-loop closure at back neck. Also has inverted box pleat at center front, three-quarter-length sleeve with inverted pleat at sleeve hem, on-seam pockets, separate hem facing, and slight gathering at sleeve cap. After successfully sewing this pattern, you will have developed the following skills: curved seams, flat piping, flat-set sleeves, gathering, in-seam pockets, and pleats. 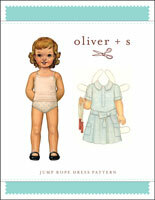 Light- to medium-weight woven fabrics like quilting cottons, broadcloth, denim, gingham, chambray, gabardine, or seersucker, and linen. Dress Length 17 1/2" 18" 18 5/8" 19 1/2" 20 3/8"
Chest 22 1/2" 23 1/2" 24 1/2" 25" 26"
3/4 Sleeve Length* 9 5/8" 10" 10 5/8" 11 1/4" 12 1/8"
Dress Length 22 1/2" 24 5/8" 26 3/4" 28 7/8" 31"
Chest 27" 28" 29" 30" 31"
3/4 Sleeve Length* 13 3/8" 14 1/2" 15 3/4" 16 7/8" 18 1/8"
I am new to sewing still, more of a confident beginner. I sew mostly for my twin girls , who are almost 10. 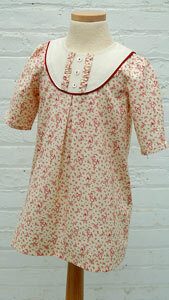 I tried this pattern and BOTH girls loved it, they loved the fit ( spot on), the yoke and pockets. It wasn't too babyish and is fun enough with color blocking or accenting the yoke piece to have it deemed tween approved. Since making my test dress with pillowcases lol, I have cut out 4 more and can't wait to sew it up again. This pattern goes together perfectly - of course. The size is spot on. 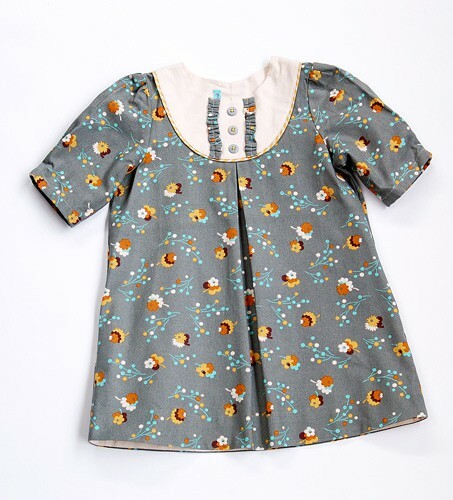 The yoke design lends itself to all kind of embellishment - lace, piping, those special buttons, embroidery, whatever. Or none - it's still beautiful. Also, it's great as an in-between season dress because of the 3/4 length sleeves. Seriously, you can't go wrong with this pattern! Pattern was not easy to figure out. I am a seasoned seamstress and it was difficult. 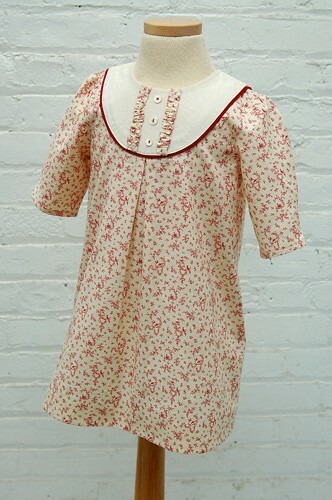 In fact, only used collar and adapted to another pattern.love the look! Would you like a Playdate? The answer would have to be, 'Yes,please'! I adore this dress. It is such a gorgeous mix of old world charm and well cut modern style. I blogged a complete tute here http://fiveandcounting-motherof5.blogspot.com.au/2011/10/time-for-playdate.html . Some girls find it a little firm over a toddler size head but I offer a few suggestions on making the opening larger in my blog post. A very easy fix, even if you have finished the dress. I am all ways amazed at Liesl's skill in designing clothes that work well on an infant but translate to an older sibling as well. http://www.flickr.com/photos/motherof5/4801829602/in/set-72157625295306988 The yoke can be trimmed or left plain. Piped in a contrast or made in self fabric for a contemporary look. The classic white yoke is my favourite. I even had a go at lining it http://fiveandcounting-motherof5.blogspot.com.au/2011/10/sewn-with-love-lined-playdate-dress.html (There have been other methods explained, check out the o+s forum for tips) A lovely girls dress, another lovely pattern that I am so glad to see released as a digital pattern. It's hard to pick a favorite O&S pattern, but this one is definitely a contender! It is a surprisingly quick and enjoyable sew. I love how the back opening in the yoke is constructed, and I always use a little elastic cord loop in place of a fabric button loop. My daughters like the pockets, too. This dress is adorable. It has turned out great every time I have made it. It has really practical in seam pockets for a little girl. Both mother and daughter approved! 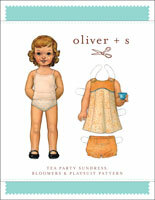 Discussion on the digital playdate dress sewing pattern from the Oliver + S Discussion Forums. Find and share more photos on Instagram using the hashtags #playdatedress and #oliverands.